At the January 2016 meeting of the Ottawa Woodworkers Association, Club Secretary Paul Mahood passed out wallet-sized membership cards to all registered members who were there. The desire to have membership cards came about because Wayne Richardson, Public Relations Officer, has approached several businesses to secure discounts for members of the OWA. 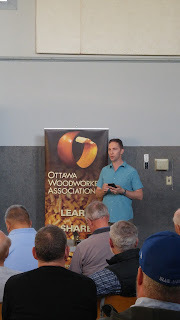 Mark Allen (no, not our Mark Allen, the other Mark Allen) has agreed to a discount to card carrying members of the Ottawa Woodworking Association. He carries General International and King among other lines, and can probably order from other manufacturers. He also carries used and refurbished machines. If you're looking for something specific, maybe Mark can find it for you. Thanks to George Fouriezos for setting this one up. At Preston Hardware, our membership cards entitle us to present ourselves to the Contractor's Counter. This means discounted pricing for certain labeled items. We thank Wayne Richardson for setting this discount up. Ottawa Fastener Supply has provided us with a schedule of varied discounts depending on the item. Thanks go to Wayne Richardson.